Any man can wear a wristwatch, but it takes a special gentleman to understand the merits of owning a pocket watch. Wristwatches dominate the world of timepieces today. But, the distinguished precursor to the wristwatch, the pocket watch, gave birth to the wristwatch. The first wristwatch, made by Patek Philippe in 1868, graced the royal personage of Countess Koscowicz of Hungary. Still, men found putting a small timepiece on their wrist too feminine; it was like wearing women’s jewelry. Real men abreast of the current fashion owned a pocket watch. The pocket watch ruled the portable horology world for about 50 years from the 1880’s – 1920’s. In actuality, the wristwatch came about during World War I. Soldiers found it inconvenient not to mention dangerous to pull out their pocket watch to check the time while they were in the trenches. As they say, necessity is the mother of invention. Soldiers jerry-rigged their pocket watches to fit on their wrists via cupped leather straps. Soldered wire loops replaced the cupped leather straps and wire loops later gave way to the lug. Thus, men found their way into turning the watch into a masculine item. Fashion has always been a fickle mistress. She favors one thing only to toss it aside for another, and then through her tricky wiles, reaches back to bless one of her original favorites. So it is with the pocket watch. 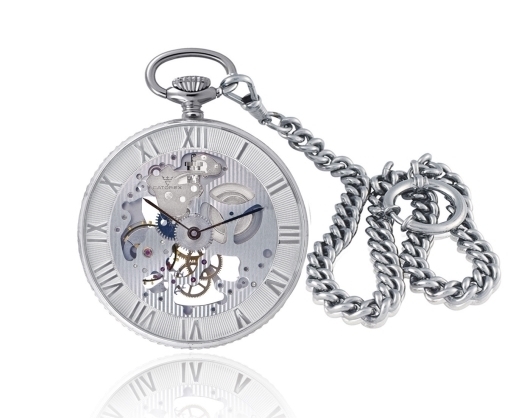 Though wristwatches are still the predominant choice, especially for a first watch, pocket watches have made a comeback. You can find many brands putting them back into production. And, it’s obvious why. 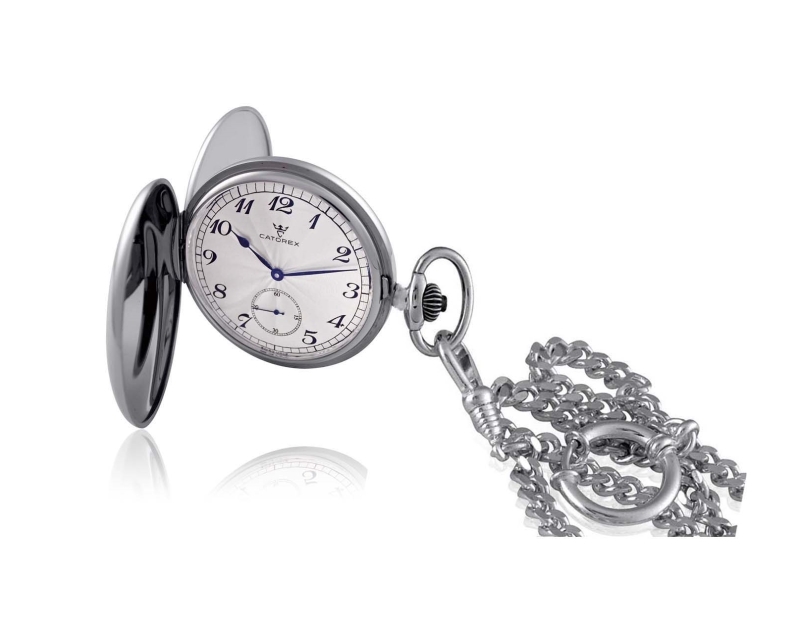 A pocket watch makes quite a statement when pulled out of a pocket or removed from a vest pocket on a fob and chain. It can turn any man into a dandy and a representative of fine taste, setting him apart from the crowd. 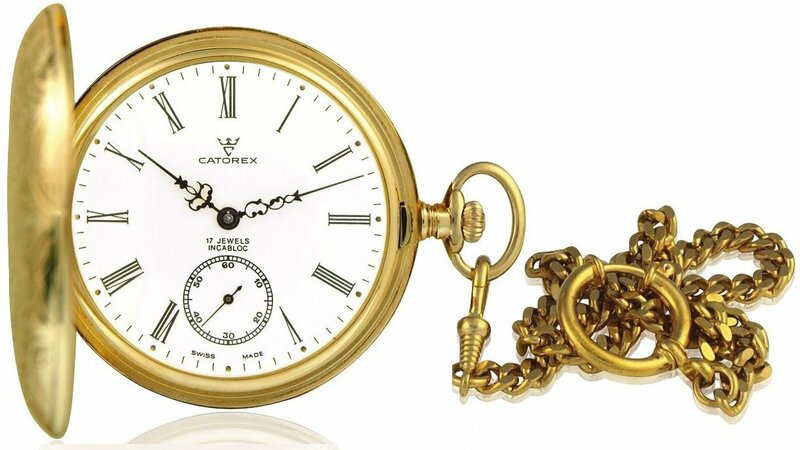 Catorex is a brand that knows pocket watches. Since the company’s founding in 1858, it has been a specialty of the house. Currently Catorex produces 20 models ranging from traditional to modern interpretations. 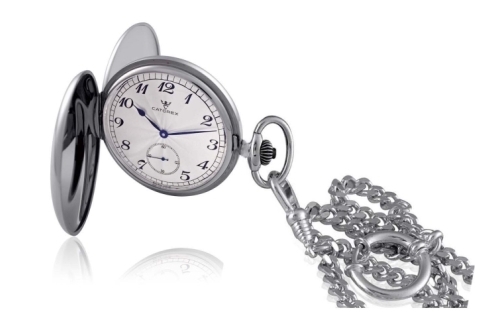 The Armand Cattin Stainless Steel Sunray Sub-Seconds Mechanical Hand-Wind Pocket Watch is a more traditional style. In a stainless steel hunter case, which means it has a lid, the pocket watch is a time only model with sweeping sub-seconds at 6 o’clock. The sleek silver sunray dial features stylized hour markers that add solid character. Catorex wisely chose to put a mechanical hand-wind movement, the ETA 6498, in the Armand Cattin, keeping in tradition with a pocket watch’s roots. This solid and stately pocket watch comes in a 53 mm diameter and 14 mm profile that fits comfortably in the palm of the hand. Although you might not have heard the name Catorex floating around horology circles, they in fact are a Swiss company with roots dating back to the late 18th century when Georges Ignace Cattin starting making watches. Since then, the company has stayed in the family, passing down through generations. 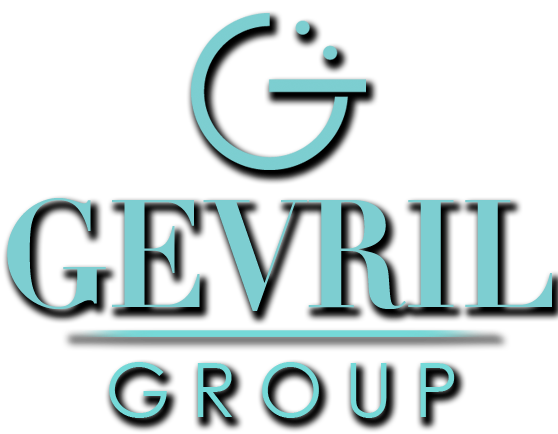 The director, Guy A. Cattin, represents the 6th generation in charge of this independent company. Due to the fashion of the day, Catorex mostly focuses on men’s watches but pocket watches have a special place in their heart, since this timepiece is where it all began. While current brands that make pocket watches only have a few in the catalogue, Catorex has 20, a strong indication of their commitment to this bygone era when railroads were the main form of transportation, skyscrapers pierced the skies and speakeasies were all the rage with the likes of Zelda and F. Scott Fitzgerald dancing the nights away. But quite recently, the pocket watch has made a comeback. Once the discarded and stodgy grandfather to the wristwatch, the pocket watch has regained respect among the upstart whippersnapper watches. Skeletonized pocket watches are a special category of the genre. Not only are they difficult to execute, they reveal the beauty of the movement. Skeleton watches are different than open-faced watches, which are made to show parts of the mechanics below. A skeleton watch starts with an existing movement that is then altered through the cutting away of the plate, bars and bridges to create a beautiful design. Oftentimes they are also engraved. 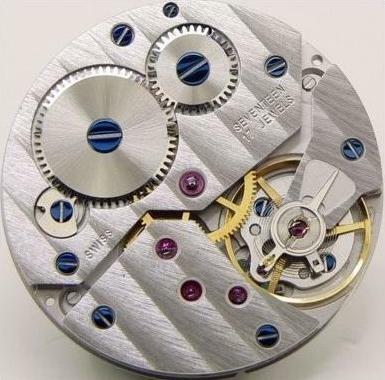 In their original form, the bridges and main plate of the movement are strong and stable. Skeletonizing makes them more fragile and if it isn’t done correctly then the movement loses its function and will fail or break. Usually 60- 70 % of the material in the movement is cut away. It’s a dangerous game of knowing how much to leave and how much to remove because like an enamel watch, mistakes result in putting the piece in the trash heap and starting again. 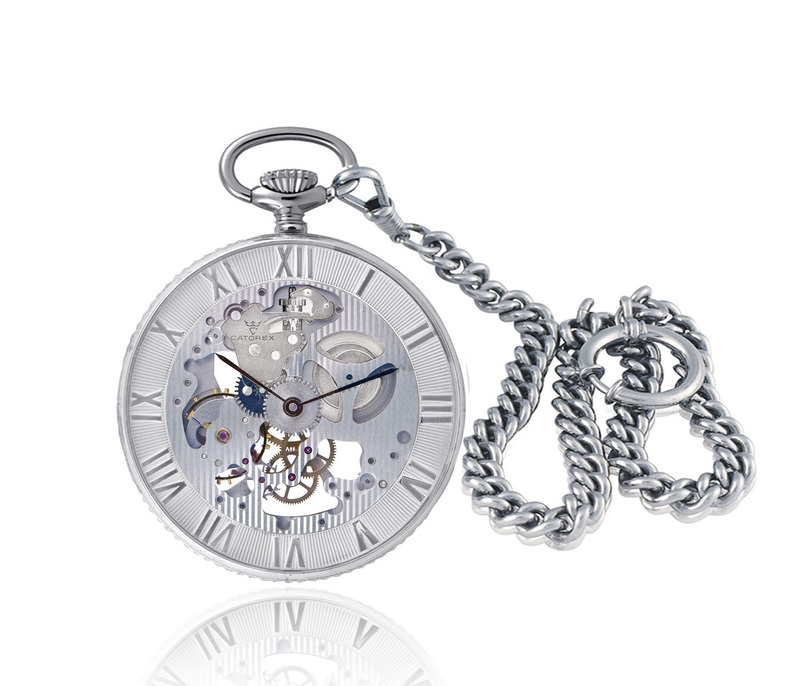 In the Armand Cattin Sterling Roman Numerals Exhibition Pocket Watch, Catorex gets it just right, presenting a lovely design that also allows for appreciation of the mechanics working below. 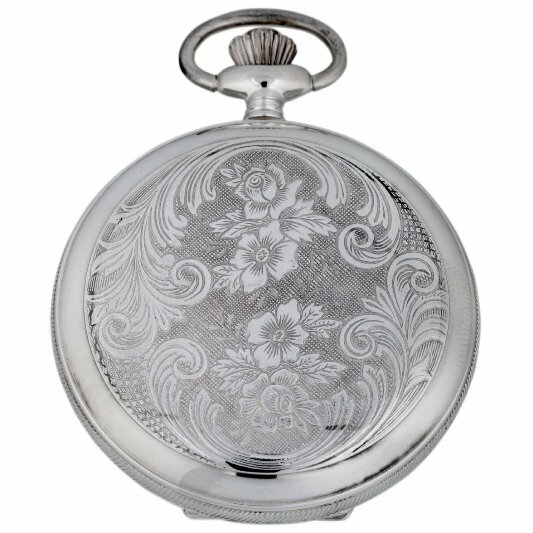 The watch comes cased in a sturdy and pure 925 silver case without a cover, which is referred to as a Lepine case. Those with a cover are called Hunter. The dial is a nice balance of modern style skeletonization with a complementary nod to the traditional with the Roman numerals circling a guilloche ring. A hand wind movement, a must in a skeletonized watch so you can see the dance of the escapement ticking away, powers the Armand Cattin Sterling Roman Numerals Exhibition Pocket Watch. The exhibition back allows a view of the back of the movement, giving double the visual enjoyment. Catorex Cattin Watchmakers have been making high quality mechanical watches in in Switzerland’s Jura region since 1785. 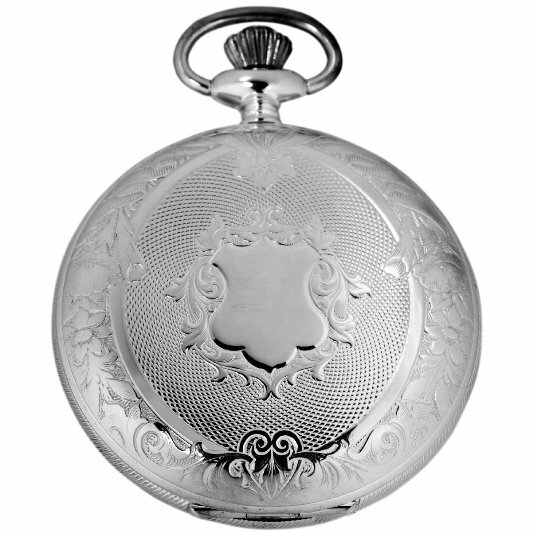 Almost since the very beginning, pocket watches have been a specialty of the family business. When other Swiss watchmakers quit manufacturing pocket watches, Catorex did something different: they updated them for the modern world. 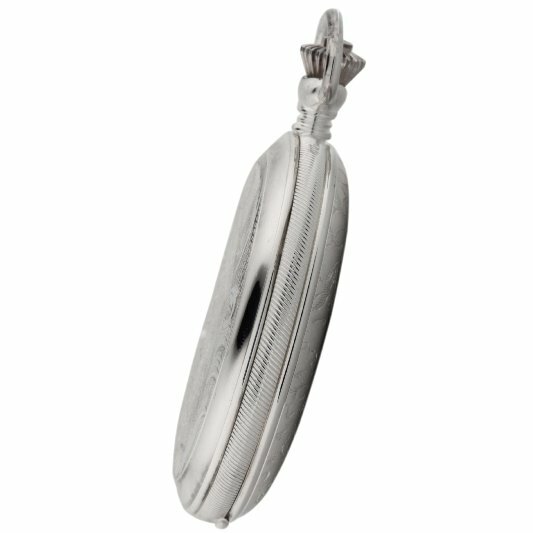 Catorex has almost singlehandedly brought pocket watches back from obscurity and made them popular again. These handsome timepieces definitely aren’t the same watch your grandfather used to wear. They incorporate modern, precision Swiss made movements, engineered to provide years of reliable service. The company currently offers six different pocket watch collections, with 45 different models from the traditional to the avant-garde. The popular Les Breuleux Automatic White Dial model provides a good example of why Catorex pocket watches have become so popular. This traditionally styled 49mm watch features a spectacular hunter style 18k gold plated brass case with a handsome white enamel dial and delicate traditional hands. The watch is powered by a reliable automatic 17-jewel incabloc movement that will provide years of trouble-free service. The watch comes with a matching 18k gold plated watch fob and is equipped with a durable mineral glass crystal. For discriminating traditionalists, this watch provides the experience of wearing your grandfather’s watch with none of the hassles of keeping an antique watch running. Guy Cattin, the family’s current owner, has made a commitment to creating a new generation of mechanical watches that have been adapted to the personality, taste and needs of today’s sophisticated consumer. If you would like to experience what it means to own fine Catorex pocket watch yourself, look for an authorized Catorex dealer and reserve your Les Breuleux Automatic White Dial today. Jacques Gevril was appointed Watchmaker Royal to the Spanish Crown in 1758 for his mastery in the art of producing impeccably crafted timepieces. 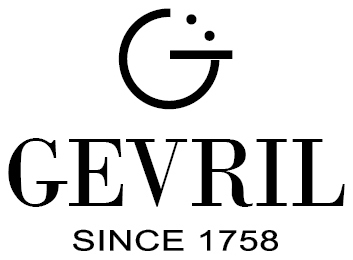 More than 250 years later, Gevril’s 1758 Collection offers an ode to these historic works. Long before people donned wristwatches, pocket watches were the trusted companions of those with a desire to keep time at hand, and while carrying a pocket watch in the 21st century might seem an anachronism, it represents a tangible connection to the high art of mechanical watchmaking. In fact, the pocket watch is characterized by an experience unequaled by the average wristwatch. 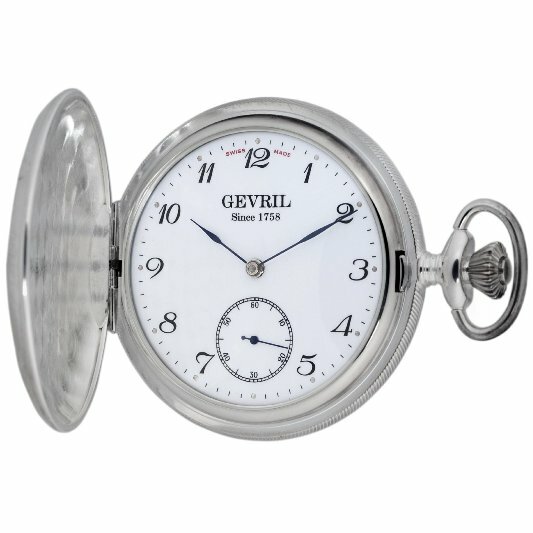 By comparison, a wristwatch is passive, requiring a mere glance to read, whereas the owner of a Gevril 1758 pocket watch must engage with the timepiece. There is the initial reach into the pocket, followed by the sublime feel of engraved, polished 925 sterling silver between the thumb and fingers; the round 49 mm case is substantial, yet balanced by an elegant proportional thinness of just 13 mm. Once in hand, the superb details of the case become apparent. The front features three distinct areas: a coat-of-arms style shield at the center (perfect as is, or if desired, with an engraved personal message) surrounded by a guilloche barleycorn pattern and enclosed by a traditional floral pattern. The back of the case has a more elaborate floral design incorporating scrolls and multiple textures. The watch opens with a gentle push of the clasp. The Gevril 1758 features a savonette configuration, meaning the seconds hand and winding stem are positioned at a 90 degree angle from each other. This arrangement makes it easy to wind and read the watch simultaneously. True to its roots, the 1758 contains a mechanical hand-wound Unitas 6498 Decorated movement – another step worth savoring. An uncrowded white dial with silver hour markers and large, black painted numerals in vintage-style script greets the owner. The blue hour and minute hands are reminiscent of the “feuille” style, and the seconds sub-dial is defined by a classic railroad-track perimeter. The Gevril 1758 pocket watch is indeed a direct link to old-world watchmaking and a perfect distinguisher for the fast-paced modern man who relishes the more gentlemanly moments in life.